Here at the Do-It Corporation, we are constantly looking for ways to help our customers increase their sales, and California Organic Raisin found a great way to Do-It with our carry handles. Increase Sales By Doubling The Product. Even at a discount, retailers know that making the sale means success. Combining two packages together with two carry handles is attractive to busy shoppers, that enjoy the convenience of buying bulk. Bulk shoppers also see an advantage to buying two smaller packages over one larger one so that contents stay fresh longer. Customize With Branding. These carry handles have a clean, clear look but carry handles can also be printed with your company’s logo or a special message. Retail stores that want to make carrying large items easier for customers will frequently have carry handles printed up and ready for their cashiers to apply to large items that don’t fit well in a bag. Product manufacturers like to print either their own corporate branding or a special message about the product. Clear handles work well too, giving the final product a clean look. Easy to apply. Do-it carry handles can be attached to packaging in the store, which is a great option if you need to bundle items after they’ve arrived but can also be applied in the factory before they reach their retail destination. The good news is that in any location they’re easy to apply. With the proliferation of shopping clubs, consumers are not only comfortable with buying bulk, they enjoy it. 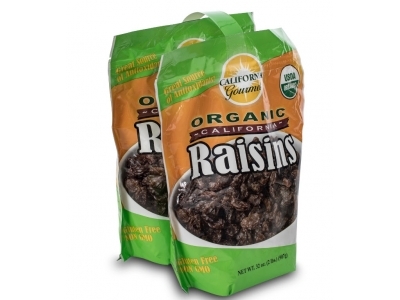 We were proud to partner with California Organic Raisin to make doubling up the product easier with our carry handles. With one placed on top, and another handle joining the bottom of the bags together, customers were easily able to get their raisins home and into the pantry. Contact us here at Do-It for other great attention getting ideas!